Good health is the most important asset a person can have. Medical innovations help to better fight illnesses, enabling people to live longer and more active lives. MEDICA is the world’s largest event for the medical sector and an unmissable date in the calendar of anyone involved in medical technology. Anyone who wants to be up-to-date and informed about the latest trends in the health sector cannot afford to miss this medical trade fair. MEDICA is organised annually by Messe Dusseldorf and attendance is only permitted for to trade visitors. The largest international trade fair for medical technology, electromedicine, laboratory equipment, diagnostics and pharmaceuticals will be held for the 50th time on 18 – 21 November 2019. With over 5,200 exhibitors from 71 nations and around 120,000 visitors, it’s the world’s largest medical fair, reaching a diverse audience! As ever, the primary emphasis will be on the fair’s international reach. The healthcare industry is currently experiencing a rapid process of change, meaning that the demand for healthcare products and services is huge. Digitalization in medicine in particular is continuing at a rapid pace, adding new market segments to the health market. The top-class trade fair programme consisting of conferences, forums, symposia and special exhibitions reflects the full range of innovations in outpatient and clinical care. As the undisputed leading international market and information platform, the annual trade fair is attended by numerous experts from the fields of medicine, business and politics. Year after year, the leading trade fair attracts a notable expert audience to the state capital of North Rhine Westphalia. The specializations of laboratory medicine/diagnostics will use the new Hall 1 (12,500 square metres of floor space) and, as previously, Hall 3 located directly beside it. Physiotherapy/orthopaedic technology can be found in Halls 3 to 5. Medical commodities & consumer goods will occupy Halls 5 to 7 and 7a. Electromedical equipment/medical technology, information and communication technology, medical furniture, as well as a special room set-up for clinics and practices, will be located in Halls 9 to 17. Digital health and medical technology are continuing to converge. Increasing numbers of medical products are using artificial intelligence to diagnose patients more precisely and treat them more effectively. That’s why, from now on, MEDICA will also host the information and communication technology segment in Hall 13 with direct access to Halls 9 to 14 for medical technology and electro medicine. Halls 8a and 8b are again reserved for COMPAMED 2019 – hightech solutions for medical technology. It is the international trade fair for the medical supplier industry and product development. In an area spanning more than 11,000 square metres, the complete range of products, materials and services for the medical industry will be exhibited. Medicine is a constantly developing area, which is why doctors are obliged to participate in continuing education and to stay updated with current developments as best they can. MEDICA ACADEMY, the further education event held as part of MEDICA at the CCD Congress Center Dusseldorf / CCD South, offers doctors and medical professionals the perfect opportunity for further education over four days. Whole-day courses will examine selected key medical themes, as well as topical issues such as hospital hygiene. If you also wish to participate in MEDICA 2019 as an exhibitor or visitor, don’t worry about organizing your stay: HM business travel will take care of the organization of your business trip, from the hotel booking to the travel expense accounting. When booking a trade fair hotel, we focus exclusively on your personal preferences and try to find a hotel in the desired price and service range. You simply tell us how many rooms you require for the trade fair, whether the hotel should be in the inner city, near the trade fair or a little further away, and which price and hotel category you have in mind. On this basis, we draw up a non-binding, tailored quotation within just 24 hours. Find out about our services and book your hotel for MEDICA 2019 today! 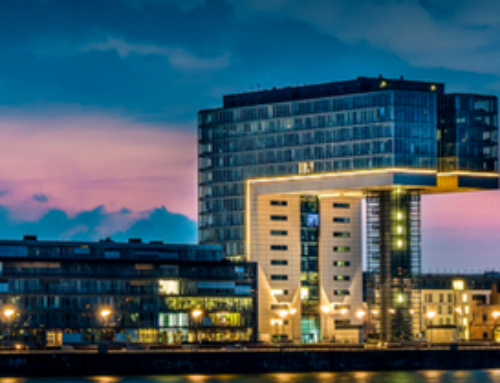 Due to the excellent infrastructure in Düsseldorf, you can reach the exhibition centre from any of our partner hotels without any problem.